ASLE member Juan Carlos Galeano’s interests in cultures of the Amazon basin and the natural world are reflected in his current literary projects and in his direction of the Florida State University program “Learning and Service: Journey to Amazonia” in Peru. His current creative projects include a collection of poems, “The river,” that he envisions as an ontology of rivers portraying them as sentient beings in interactions with humans and their territorial surroundings. With the Amazon river and its tributaries as a source of inspiration, Juan Carlos explores the human condition, sense of place, and “mutuality of being” using a colloquial style, humorous tone and sense of irony of modern societies that integrates the surrealistic style of Western poetics with the animism common to Amerindian and traditional world cultures. He is also working on a poetic work entitled “Mythical Beings of Amazonia”thatintegrates key elements of Amazonian cosmologies. Native Amazonians perceive the world in a monistic way where there is no conceptual divide between nature, humans and spirits. Gods, demons, tricksters, artifacts, and objects all share a spiritual and human essence that unites them. These supernatural beasts and forest defenders, aquatic seducers, special places and birds exist to this date in the imaginations of forest, riverbank and small town dwellers in the seven countries that make up the Amazonian basin.In this belief system forest creatures, magical animals, birds and plants live in a socialized nature. They all have shape-shifting qualities that allow them to turn into friendly beings, predators, lovers, forest and river protectors as they interact among themselves and with other human and non-human entities. Because of the vision of reciprocity, interconnectedness and a sentient nature depicted in these poems about supernatural creatures the poems carry metaphorical messages of the need for environmental mindfulness that have a current relevancy to people from both modern and traditional societies. Juan Carlos is also working on an anthology of environmental poetry for Spanish speaking audiences. Tentatively called Doce poetas de habla inglesa y la tierra, (Twelve English Speaking Poets and the Earth), the anthology will introduce Hispanic audiences to a spectrum of poets whose works reflect contemporary sensibility about the environment. The anthology will include the work of twentieth and twenty-first century English-speaking poets whose work displays an ecocentric perspective. Selected poems will be translated into Spanish and presented along with the English version. There will also be a biographical sketch of each poet and an introduction by professor of English and ASLE member Paul Outka. The poets selected for this anthology include A.R. Ammons, Wendell Berry, Elizabeth Bishop, Ted Hughes, Robinson Jeffers, Denise Levertov, W.S. Merwin, Mary Oliver, Kenneth Rexroth, Leslie Marmon Silko, Gary Snyder and Derek Walcott. In addition to his literary projects Juan Carlos, along with Rebecca Galeano (from the Florida State University College of Education), is the director of the Service/Learning program Journey into Amazonia, a summer program in Iquitos, Peruvian Amazon. The program designed for students who would like to experience life in the Amazon while working in service learning fieldwork. Student participants enroll in “Regional Cultural Studies: Journey into Amazonia,” a course that introduces representations of the area and the relationships between indigenous, mestizo and recent arrivals to their environment, and do volunteer work in Iquitos and in nearby riverine peasant and indigenous communities on the Amazon, Nanay and Itaya rivers. In addition to classes and activities, students participate in the daily life of the Iquiteños by living in homestays and learning simultaneously from specialized Peruvian professionals. These professionals present an overview of important topics related to culture and development in the region: indigenous cultures, health and medical issues, ethnobotany, forestry and sustainable practices and the cultural arts. Juan Carlos Galeano lives in Tallahassee, Florida, and is a professor in the Department of Modern Languages and Linguistics at Florida State University, where he teaches Latin American poetry and Amazonian Cultures. Excerpts of his work from collections of poems and folktales as well as information about his documentary film The Trees Have a Mother can be found at his web site. 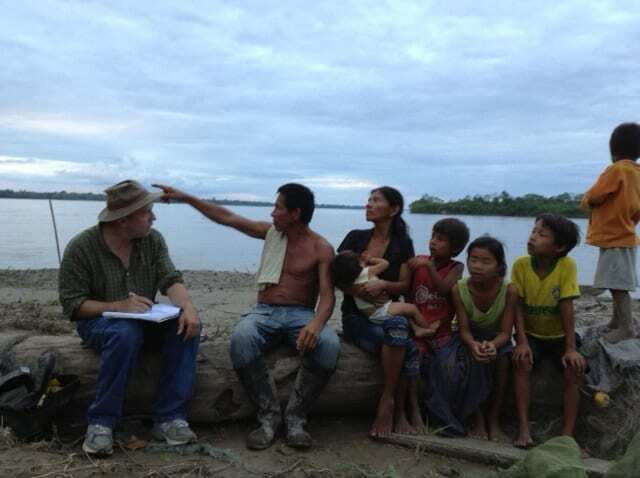 For invited lectures on oral narratives, folklore, readings, presentations/ discussions of the documentary film The Trees Have a Mother or organization/direction of academic (service learning) programs in the Amazon basin during summer and winter breaks, Juan Carlos Galeano can be contacted by e-mail or by phone at (850) 321 5251.